G is for… Green Tea Frappuccino! Powdered green tea is used to flavour all sorts of products in Japan, from cakes and cookies, to drinks and puddings. It’s a great flavour, and makes a nice change to usual flavours like caramel and vanilla. 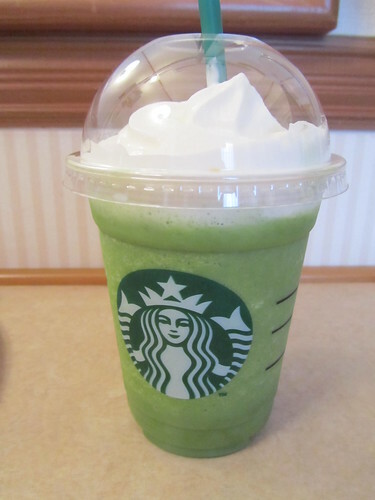 Green Tea Frappuccino is my absolutely favourite thing to order in Starbucks in Japan, and I couldn’t even guess at how many I’ve had. Each time I’ve been to Japan it’s been one of the first and last things I do. If I could have brought some back with me, I would have. Of course, this kind of drink is not limited to Starbucks, and many similar drinks are available in other cafes and restaurants. 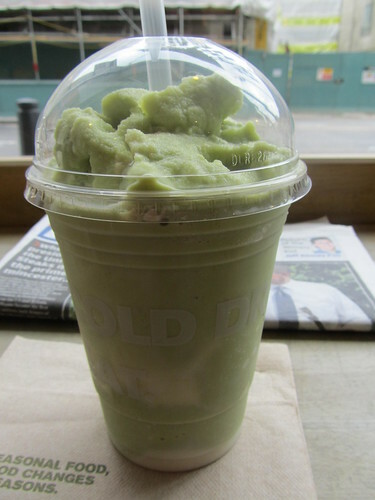 In fact, in lieu of Starbucks’ Green Tea Frappuccino in the UK, I have been becoming quite addicted to Eat‘s “Matcha Chiller”, which is surprisingly similar. If you visit Japan, you might think you shouldn’t visit Starbucks because you can go there back home. I thought that at first, but Starbucks soon became one of my favourite places to chill out in Japan. The menu is really quite different compared to Starbucks in the UK, and they have some really interesting seasonal variations (such as “Sakura Frappuccino“). Also, they sell a smaller size (called “short”) in Japan, which is not available in the UK. This means you can sample a Green Tea Frappuccino and it won’t cost you an absolute fortune. This post is also an entry for the July 2011 Japan Blog Matsuri on the topic of “Japanese drinks”. For more information about the Japan Blog Matsuri, please click here.